A parole board in California has recommended parole for Manson cult killer Leslie Van Houten, 69, who participated in the murders of Leno and Rosemary LaBianca in 1969. Now it is up to California Gov. Jerry Brown (D) to decide if he will accept or reject the parole board’s recommendation that Van Houten be freed. The previous day, Manson cultists tortured six other people to death (including Sharon Tate’s unborn child) in the infamous Tate murders. Despite her heinous crimes, Van Houten is being recommended for parole because she allegedly “rehabilitated” herself in prison by “earning a bachelor’s in English literature and master’s degree in humanities while running self-help groups for incarcerated women,” the Los Angeles Times reports. Real rehabilitation is not about getting a bunch of college degrees, particularly when the people giving you those degrees are anti-incarceration activists trying to get you freed from prison. What Van Houten has actually been doing in prison is protesting the prison system, a protest that began even before her trials had ended. She and the other murderous Manson women enjoy the support of their own cult – a cult of elite academicians and “human rights activists” who have agitated for their release for decades. Through public universities such as the University of California at Santa Cruz, our tax dollars support this sick cabal of feminist intellectuals as they try to free woman-and-baby-killers (Sharon Tate was about two weeks away from giving birth when she was slaughtered, along with the unborn baby, Paul Richard Polanski, inside her). 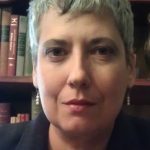 Professors such as Karlene Faith (who was named for Karl Marx and became close friends with the “Manson Girls” while pursuing her dissertation in the UC Santa Cruz History of Consciousness program) have long used the taxes we entrust to universities to write and publish pro-killer garbage like Faith’s 2001 book, The Long Prison Journey of Leslie Van Houten: Life Beyond the Cult. Life Beyond the Cult was published by Northeastern University Press. Universities are filthy with this stuff. I offer everlasting thanks to Leslie Van Houten, for all the ways she reveals her deep humanity and respect for life … I am grateful to have known Leslie as a friend since 1972. I have endeavored to do her justice without fanning or dismissing the enduring grief of Leno and Rosemary LaBianca’s families. Leftist anti-incarceration cultists always see evidence of unusual “humanity” and “respect for life” in the most vicious and notorious killers. Conversely, victims and survivors of crime are small-minded, repressed people, not driven by a desire for justice but only for vengeance. You have to smear the victims to elevate their killers. When Faith wrote that she did not wish to “fan” the “enduring grief” of the LaBianca family, what she was really saying was that the surviving family members’ irrational, vengeful emotions should be suppressed, not recognized by the court. Leslie Van Houten is not the only Manson cult killer to receive this sort of servile adulation from academic and legal activists. Susan Atkins, who licked up Sharon Tate’s blood over the course of torturing and killing her, also became the focus of a feminist anti-incarceration movement dedicated to freeing her. With their help, Atkins published her autobiography. She was permitted to marry twice in prison and receive conjugal visits. Happily, she died in prison despite the feminist cult’s best efforts to free her. Offing those rich pigs with their own forks and knives, and then eating a meal in the same room, far out! The Weathermen dig Charlie Manson. In 2009, her husband, fellow terrorist Bill Ayers, told the New York Times that Dohrn had been – partly – joking. The Times did not enquire further, nor did they directly quote Ayers, who has been granted significant latitude to re-write his and his wife’s sordid pasts in the newspaper’s pages. The lie that Obama barely knew Ayers has been completely obliterated by Garrow’s book: it is time to ask both Obamas directly about their real relationship with the terrorist couple and to ask reporters at the Times and other newspapers what they knew about that relationship and kept quiet, too. No doubt Mr. Manson was far more a product of the American penal institutions, where he had spent nearly half his life at the time of his arrest for the Tate-LaBianca slayings, than the counterculture. In other words, prisons cause crime, not criminals. Criminals are just free-floating victims of the American penal system. Eliminate prisons and there will be no crime. Empty the prisons and there will be no criminals. For 50 years, a large percentage of leftist activists and academicians have treated these insane delusions as truth. To anti-incarceration professors like Faith, even murderers are just victims of the American prison system – even murderers are just political prisoners being held to sate the vengeful appetites of crime victims and other law-and-order types. Faith died just a few months ago. Despite her activism since 1972, she did not live long enough to see Van Houten released from prison. Far from being “remorseful” or “rehabilitated,” Leslie Van Houten long ago declared herself a political prisoner with the support of her cult of leftist academicians, as did fellow Charlie’s Girls Susan Atkins and Patricia Krenwinkel. To let Van Houten go free now would affirm the insane moral nihilism that drove both Charles Manson and the Charles Manson Cult Cult. It would mean that Charlie has finally won.